25 years of Kirby - What was your first Kirby game? Nintendo's pink puffball Kirby turns 25 years old this month. Actually, and I'm old enough to remember this, Kirby was originally white when he first hit the Game Boy in Kirby's Dream Land. Pink wasn't a color available to his debut title, and even on the packaging, Kirby was white as a ghost! That's how old Kirby is, to make his debut on the Game Boy! April 27, 1992 saw the release of the first Kirby game, and developer HAL Laboratory boss Satoshi this message for fans to celebrate on Miiverse. Hi everyone! Satoshi Ishida of HAL Laboratory here. To put it another way, it was Kirby's birthday! 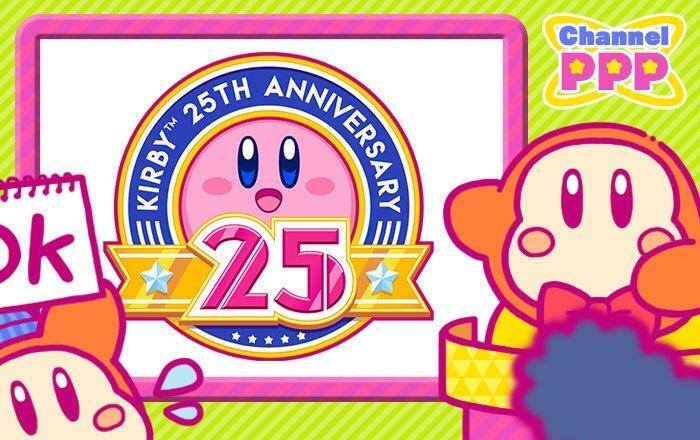 And this year was a particularly significant one, as it marked 25 years since Kirby came onto the scene! But, enough from me! Once again, the general director of the Kirby series, Shinya Kumazaki, is here with a few words to commemorate Kirby's birthday. So without any further ado I'll hand you over! Director Shinya Kumazaki also chimed in. Happy birthday, Kirby!!! It's hard to believe that it's been 25 years since you came into this world. Our youthful traveller has been inhaling all manner of things and puffing up like a big balloon, right up to the ripe old age of 25. Kirby, you've become a fine, upstanding…adult?! I must say, your plump, pink form has taken on something of a refined glow recently. And to mark this auspicious occasion, we have no less than three new Kirby games for you to enjoy! The free-to-start Team Kirby Clash Deluxe co-op action game came out just recently, and this summer we're getting Kirby's Blowout Blast, the first genuine 3D action game in the series. On top of that, we have a new fighting action game due this holiday! How have you all been enjoying Team Kirby Clash Deluxe, by the way? Since the game came out I've been getting into it all over again, playing it with my family. I reckon seasoned players could have a lot of fun supporting their teammates by playing as Doctor Healmore. After you finish the game, incidentally, a certain someone shows up in the village, looking like quite the reformed character. Why not have a look for yourself? Where did you climb aboard? I might be old enough to have played Kirby's Dream Land on the Game Boy when the cartridge was still in stores, but that's not where I first encountered the character. In 1993, my last year living in Wyoming, I was introduced to Kirby on my NES through the timeless masterpiece Kirby's Adventure. It was an eye opener, an NES title that seemed even more brilliant than the Super Nintendo games which had been floating around it. It had smooth animation, great music, and was a technical marvel, but it also perfected the idea of "secrets," alternate paths, and giving players ample space to explore and dig through its levels. None of the game's optional switches are particularly challenging to find, but at the same time, you'll be pushed to uncover them all to get the 100 perfect. Super Mario World offered this kind of experience on the Super Nintendo, but not until Kirby did we get such a brilliant NES take on it. And honestly, it's all been downhill from there. Not that Kirby games are inherently bad, but whenever a new one comes out, I still find myself comparing it to the original and feeling that it comes up short. 18 years later, this is easily still the best Kirby game around.